Like something straight out of a Virginia Woolf novel, two lesbian penguins have been living a secret life together in an Israeli zoo. Penguins mate for life, so when Suki and Chupchikoni formed a pair bond, zookeepers at Ramat Gan Safari park assumed the two were male and female. NBD, just another couple of crazy kids in love, ready to start building their lives together in their own little metaphorical patch of ice they'd carved out of a fake penguin habitat in Israel. 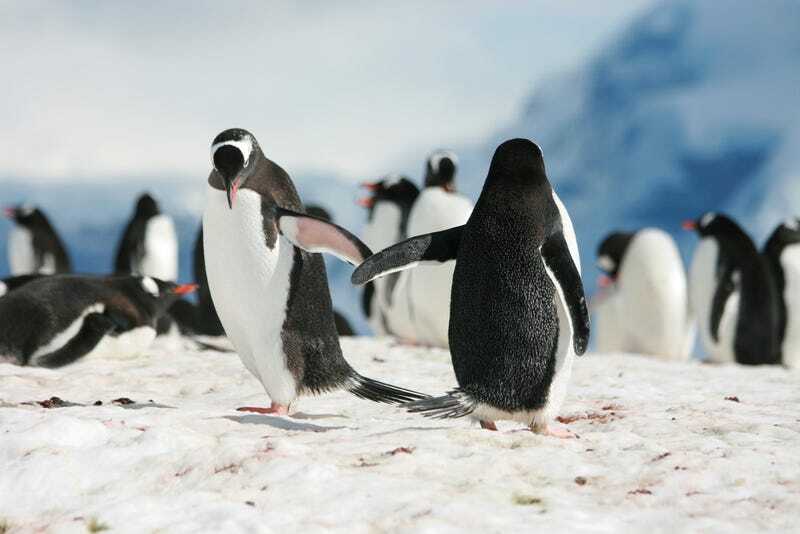 Like in the case of, say, corn snakes or Siberian hamsters, "There is no way of telling a male penguin from a female just by looking at them," explains Safari spokeswoman Sagit Horowitz. "But usually the keepers can guess the gender by size and behavior." But surprise, surprise! A blood test was administered during an unrelated study and much to everyone's surprise, it turns out Chupchikoni is actually a lady penguin. However, these lesbian penguins aren't letting love go to their head like you did when you met that cute boy who worked at the Sam Goody who you almost ran off with him to go sell vegan brownies on the Phish tour until your parents stepped in and threatened to have you committed. Suki and Chupchikoni are taking things slooooow. Suki and Chupchikoni have yet to build a burrow of their own, but they have clearly set up house together, creating a scrape into which they collect nesting materials. So far, all very conventional. So, you know, for now they're just leaving a toothbrush or a change of underwear at each other's burrow. All very conventional, indeed! And don't even go there with the snarky DUH LESBIAN PENGUIN IS LESBIAN BECAUSE SHE CAN'T FIND A MAN WHO WILL PUT UP WITH HER CATS AND KNITTING ALL DAY. Turns out Suki and Chupchikoni had quite a lot of male prospects, thank you very much, and actually just chose to be with one another. The head of the Safari Avian Department, Tamuz Setti, assured naysayers that the two young lesbian penguins did not choose one another for lack of options, as their were a number of male suitors at the Safari park, but rather that they clearly chose to mate with one another. "There are a few young available males in the exhibit. We are certain that they made a choice to be together," Setti told Haaretz. You know, I had been adamantly against the idea of a Happy Feet 3 (because, let's face it, Happy Feet 2 was a cinematic masterpiece on par with The Godfather or Earnest Goes To Camp and a third film might taint that); however...I'm sort of feeling like incorporating these two and their beautiful love could bring the trilogy full circle.